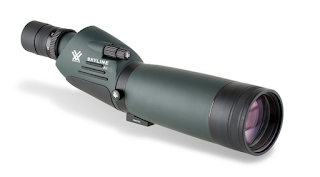 Win a Spotting Scope and More! It's time for a contest and there are three great prizes to increase your birding success. Spotting scopes let you get closer to the action and make the critical ID to either add to your life list or simply enjoy the incredible detail of birds. It is tough, easy to focus and offers great views. Refine your identification skills and enjoyment of birding with these three DVDs. Watching sparrows take you up close and personal with every North American sparrow. Watching Waders brings you inside the lives of beautiful and majestic wading birds. Watching Warblers rounds out the set with a close up look at these colorful creatures. All the DVDs are great, all three together is even better. Anyone who's carried binoculars around long enough knows that no matter how comfortable a neck strap you have and no matter how light your bins, eventually your neck will feel the strain. 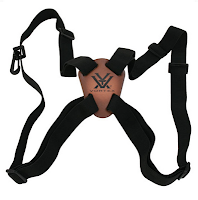 A binocular harness transfers the weight to your shoulders and can also keep your binoculars closer to your eyes and ready for action. You don't need to hunt for birds all across the net or answer any trivia, there are simply three ways to enter. Winners will be chosen by random drawing from all entries. 1) Follow @tcnaturalist on twitter. Following on twitter will earn you one entry to the contest. If you're already a follower, Thanks! Send a message on twitter that says "I follow @tcnaturalist for nature updates" and I'll count that as an entry. There's no need to unfollow and then re-follow. Clicking on the link above and tweeting about the contest will give you another entry. You can earn multiple entries into the contest with this method. Each day is a new opportunity to enter by tweeting. I will accept up to three tweeted entries per person, per day. You can modify the tweet but it must contain @tcnaturalist so I see it and it must contain the link to the contest. Subscribe via email to Twin Cities Naturalist to get regular news updates right in your inbox. By subscribing to Twin Cities Naturalist via email you will automatically by updated about the contest as well as receive the feed from the website directly to your inbox. Be sure to check your spam filter for the confirmation email. All entries will be entered into a database and randomly selected at the end of the contest. Good Luck! The Fine Print: Twin Cities Naturalist/Kirk Mona is not responsible for lost, late, misdirected, incomplete, or inaccurate entries. If your twitter account or email address is selected as a winner you must provide a mailing address within one week of the end of the contest or a new winner will be drawn. Prizes may change or be substituted at any time. Photos are just examples and may differ slightly but you get the idea. I can't believe you are reading all this. Eligibility: Contest is open to legal residents of the 50 United States. In other words, sorry, I'm not shipping prizes around the world. Some of you are not eligible. You know who you are. The Drawing: Winners will be selected in a random drawing from among all eligible entries received by midnight CST November 21, 2011 by Twin Cities Naturalist staff which is to say, Kirk. All decisions are final no matter how much you beg. Winner will be notified via e-mail or twitter. The Mail: Twin Cities Naturalist/Kirk Mona cannot be held responsible for lost, misdirected or damaged mail.